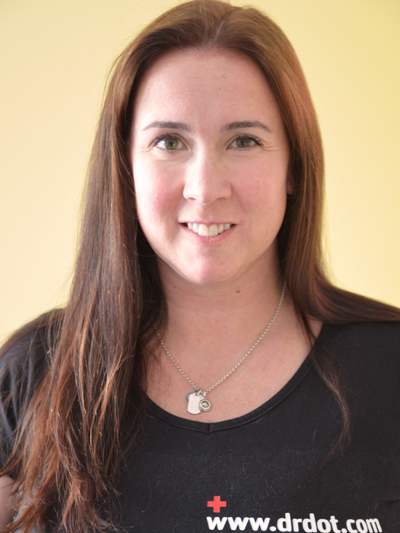 Hi my name is Stephanie, I am a Registered Massage Therapist in Calgary and work all around Alberta, including Edmonton. I have been a Sports Massage Therapist for 14 year, and have loved every minute of it. Specializing in deep Tissue, I also have many other skill sets such as Pre and Post Sporting and Concert events, TMJ Dysfunction, CORE therapy, Relaxation, Lymphatic and Myofascial Release, to name a few. And I am a teacher/ examiner here in Calgary for Massage Therapy. I have worked at many concert events and with very elite athletes of all different sports. I also work for the Canadian Swim Team and have for the last six years, working at many elite Sporting events. Joining Dr. Dots teams has been a great addition to my portfolio and I am very excited. My home town is Calgary, but also work allaround Alberta, and I am available to go on tours if needed. Looking forward to working with you in the future.